As an artist slowly venturing herself into the mystical energy of Yin and Yang, the dualities of life and fascinating traditions of calligraphy and ink painting, I can’t help but to use this lens to analyze the latest exhibition at the Metropolitan Museum in NYC on China. 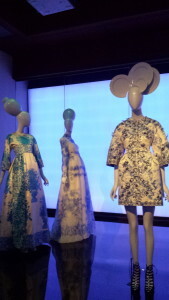 The Met’s “China: Through the Looking Glass” should be proud of their skills of executing an idea: blending elements of high fashion, film and highlights of China’s exports through the years: Silks, beading, Buddhist sculptures, ceramics, royal robes, mystical creatures, gardens, furnitures, etc. in a seamless and urban-chic way. It’s curatorship and craftsmanship into putting the pieces together is undoubtedly world-class and something the rest of the world is still catching up with. After all, museum science and the art of exhibition and display is a western invention, and the level of perfection in its presentation is something we can all learn from. Having just returning from China less than a year ago, I still remember being disappointed at the weak-lighted ceramics display in the forbidden palace and regretted for not paying extra to enter the ‘treasure’ room in addition to paying the increasing entrance fees by the year. The closed China of merely 30 years ago used to be an exclusive consumption to the Europeans and Expats who were able to catch a glance of it by a formal (political or scholarly) visit or through its exports via the Silk Route; The “opened” China today is a battleground for profits in the name of tourism and it’s identity as the factory of the world. Native speakers like myself and my family who frequently visit and stay in China are constantly in fear of scams, pirated goods, and inauthentic information despite being able to communicate directly with the service providers. Having said that, China is experiencing a fast-pace economic growth and the world is watching and wanting to have a piece of that growth. Therefore it is pretty timely that the Met puts out this exhibition for its millions of visitors coming from all over the world. This exhibition precisely emphasized on the culture of fast-paced consumption as presented by the seasonal high-fashion pieces, Hollywood glamour, exclusive consumption by the West highlighted by famous designers like Alexander McQueen and projection of Henri Matisse’s painting of woman in oriental dresses. 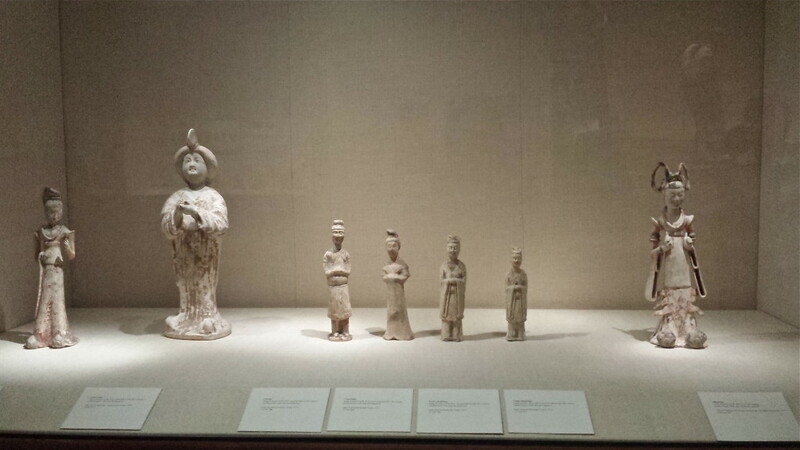 The center pieces are then juxtaposed against the collection of artifacts, history, sculptures, artistry and wisdom of ancient China as ‘informational’ backdrop. 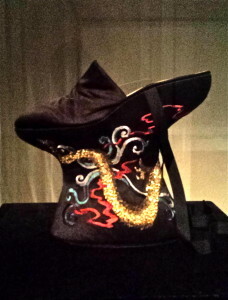 The curators do acknowledge how the Westerners would only take Chinese elements that seem exotic (dragons, dragons, dragons) and aesthetically pleasing such as the shoe-binding and opium smoking cultures (two very dark episodes in Chinese history) and would transform them into their own brands of clothing and perfumes. The general consensus of having the creative liberty to appropriate one’s culture is becoming a norm in our society. This is an exhibition celebrating that hundreds years of practice in the West starting from 18th century Europe. Sure, we (artist and designers) can take inspiration from anywhere as long as we pay respect and cite our source of inspiration. With our creativity, we can glamorize that inspiration to our consumers because we owe it to our own imaginations. 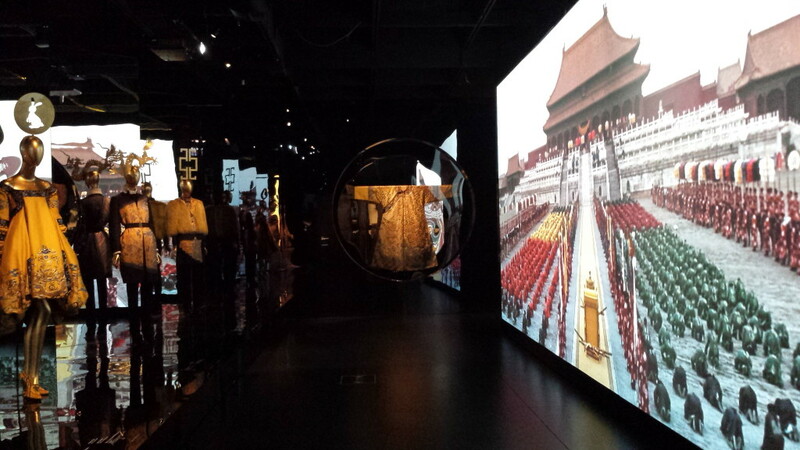 Then I wonder how thick is that looking-glass in “China: through the looking glass”? How far is our imaginations from the source? During my visit to the ceramic city JingDeZhen last year, I met a young lady (a millennial) who left her government job in her hometown to become an apprentice to a pottery master. She told me her dream is to own a pottery ‘bar’ and have adults and kids come to ‘play’ at her bar. With her minimum savings, she rented a room at the pottery studio and thought that she would be done with her apprenticeship after a month or two. She cried to me the next day, telling me that her money was stolen during the night and her master told her that her apprenticeship would take at least two years for her to be good at it. She had no choice but to ask money from her parents. The reality is, being an apprentice used to be the only option when you can’t afford school or have the grades to go to school since your master would take care of your food and lodging. Most of the artisans I met specialize in one of the hundred plus steps in ceramic making to make a living. Now, we often see privileged and educated designers or artists commissioning artisans to make their avant-garde pieces to be sold for millions of dollars in auction houses. With more and more well to do Chinese families sending their kids to international schools and schools abroad, this so-called treasures of China that is worth preserving will soon be seen as “old-fashion” or remain as inspiration to high art/fashion. This is not to dismiss conceptual art or pop art or how we make art today. I am lucky to earn that freedom myself being educated abroad and re-visited what lays in the roots of my culture. I just want to point out how short-lived all the spotlights and glamorous lifestyle young people today are aspired to, and how we could really surpass that practice and take a longer route and dive in deeper into the slow but sure, zen, spiritual, organic, ancestral past and understand the true and lasting beauty of China. Posted in EDGE Cosmo and tagged China and fashion, China and the arts, China cultural influence, The Metropolitan Museum of Art. Bookmark the permalink.